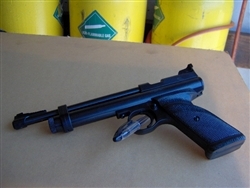 Barrel length: 12" [Add $25.00] 14" [Add $25.00] 16" [Add $30.00] 8"
Crosmans basic CO2 Pistol. Mac1 gives you an upgraded spring for an upgraded trigger. This is a very good starting point for building a custom CO2 Pistol. You can add Steel Breech, Long Barrel, Accuracy & Power Preps & Gen II BRAKES FOR A QUIET SHOOTER! Discovery Front Sight and a LPA Rear sight can be fitted as well to the upgraded steel breech or you can use the 11MM grooves to add a scope or Red Dot. Crosmans Factory Shoulder stock can also be fitted.